Kartography is my regular series in which I look at licensed kart racers throughout gaming history, and figure out where they fit on my all-time kart game leaderboard. For the first instalment of Kartography I’ve decided to look at the most recent karting game I played. 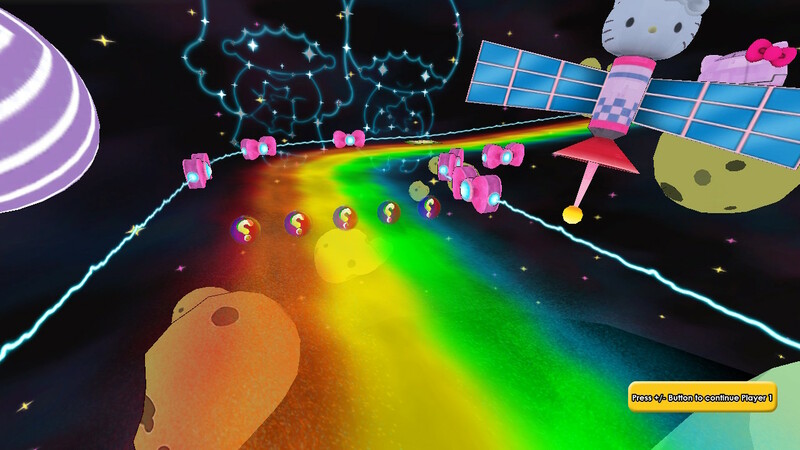 Hello Kitty Kruisers With Sanrio Friends – to give the game its full name – originally launched on the Wii U back in March 2014, where it was released in such limited numbers that it’s become one of the system’s rarest games (in America, at least: you can still get it fairly cheaply in the UK). Just a few months back, it was ported to the Switch and published by Rising Star Games. I recorded a First Play video at the time, but have since completed it. Because it’s fresh in my mind, then, it’s the first game to get the Kartography treatment. 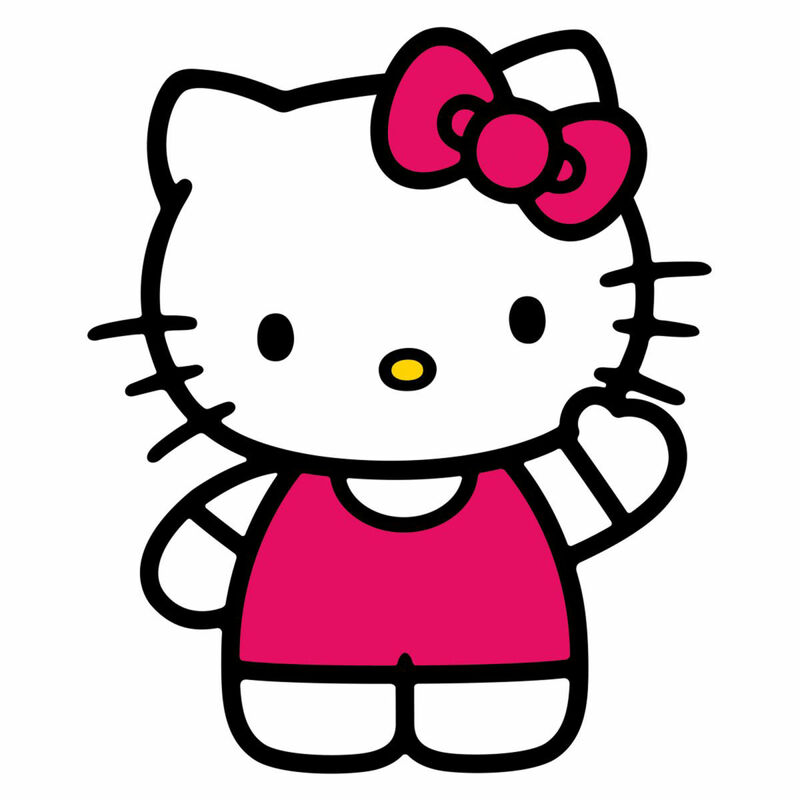 Hello Kitty is one of the most lucrative franchises in the world. It’s been estimated to have made around $41 billion worldwide since Japanese company Sanrio launched it in 1974, bringing it just behind Star Wars in terms of gross revenue. What’s less clear is how much of its fanbase is also interested in video games. Its Japanese origins suggest it isn’t an issue in its homeland, but in the west Hello Kitty was perhaps most popular in the ‘90s when it was being endorsed by celebrities like Christina Aguilera, Mariah Carey and Tyra Banks. It could be argued, then, that in the west Hello Kitty is more closely associated with fashion culture than video game culture. It appeals to those with an interest in Japanese ‘kawaii’ style, but not necessarily those also keen on gaming. While it’s undoubtedly a big licence, it has to lose a point or two because it’s fair to say the majority of the gaming community isn’t really fussed about it. There are 10 characters to choose from in Hello Kitty Kruisers, six of whom are available from the beginning. The others are unlocked by winning each of the four cups. Each character has a choice of three different outfits, but they don’t affect gameplay. In fact, as far as I can tell, none of the racers seem to have unique stats: they all feel pretty much the same regardless of who you choose to play as. Here’s a breakdown of each character, to help you get to know them better. Well, obviously. Referred to in this game as Hello Kitty, her real name is actually Kitty White and she’s a cheery, kind-hearted girl who was born in London. Despite clearly being a ‘kitty’, she has her own pet cat called Charmmy Kitty. Which sounds adorable until you consider the human equivalent: a person with a little person as their pet. Keroppi Hasunoue has a brother called Koroppi, which definitely wouldn’t have been confusing growing up. At least, not according to my friend Steven and his brother Stephen. 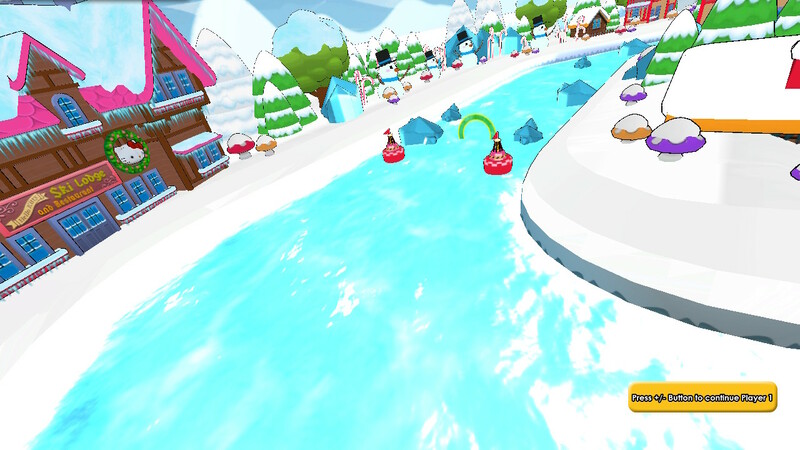 He lives in Donut Pond, which sounds to me like the perfect location for a karting game… wink wink! Sorry, I’m just winking at you. It isn’t in here. 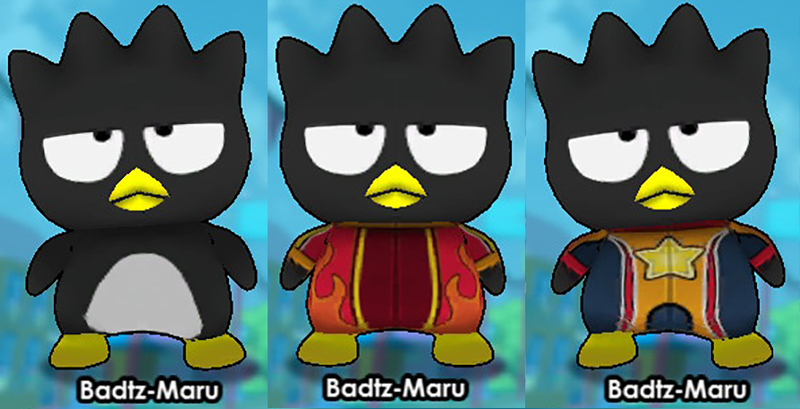 If it’s attitude you’re looking for in the world of Sanrio, then Badtz-Maru is your man. Well, your penguin. His full name is actually Bad Badtz-Maru, and his famous poses include sticking out his tongue and pulling down one eyelid. Neither of which he does here. He lives in Gorgeoustown with his mum and his pinball-obsessed dad. He’s also friendly with a white seal called Hana-Maru: the similar surnames lead to suspicion of cross-species breeding, but nothing’s confirmed. Chococat isn’t actually made of chocolate. It’s a reference to his brown nose, you see. By which I mean it’s literally brown, not that he’s always sucking up to Hello Kitty. His whiskers are actually antenna that he can use to brush up on the latest news. His parents are called Rory and Catrina, which seem like oddly normal names for Sanrio characters. Oh, and they’re divorced. Sanrio lore is more complicated than I thought. Hello Kitty’s best friend made her debut only a year after Kitty did. Her first appearance was in a retelling of Little Red Riding Hood: she continues to wear the hood to this day. Like Kitty, she was also born in London. Mariland, to be specific. There’s no such place, though there is a Maryland in London, which is home to grime ‘star’ Tempa T.
Purin’s full name is Pompompurin, because of course it bloody is. He’s a Golden Retriever, who lives in a basket in his owner’s house. So apparently cats are independent people but dogs still have owners. His hobby is ‘collecting shoes’, which basically means he spends his time stealing the shoes belonging to his owner’s family. He was voted most popular Sanrio character in the company’s official magazine in both 1997 and 2015. Another penguin, but this one’s been around the block far longer than Badtz-Maru and is generally nicer too. He was born in Antarctica but speaks good English. I’m reliably informed he owns 365 bowties, which does go some way to explaining why each of his three outfits in the game have different coloured ones. Only one outfit in the game is a tuxedo, though, which makes me think he should be called Bowtiesam instead. The newest of the characters in the game, Kuromi was created for the My Melody anime series as My Melody’s friendly rival. In the 13 years since her made her debut, she’s become extremely popular among goths and punks. Oh, and she’s the leader of a biker gang: no bikes here, though. I think I like Hangyodon best. He’s a fish born in China who dreams of being a comedian. Deep down though, he’s a sensitive soul and he always feels lonely. Although he wants to be a hero, things never go to plan. Don’t worry mate, you’ve made the cut in a Sanrio karting game, so clearly someone loves you. Originally named Baby Cinnamon, Sanrio changed this puppy’s named to Cinnamoroll a year later to avoid any possible overseas trademark problems. With what, I’m not sure. The name’s most likely a reference to his tail, which is shaped like a cinnamon roll. More importantly though, his ears let him fly: it’s odd how the cinnamon roll thing became the main focus, then. The characters are sufficiently adorable, but a Hello Kitty game’s roster is always going to consist of two tiers of popularity: Hello Kitty and everyone else. Each racer also lacks any sort of character: there are no bespoke animations or anything that makes them stand out. I learned more about each character’s unique personality after 5 minutes on Google than I did playing this for a few hours. 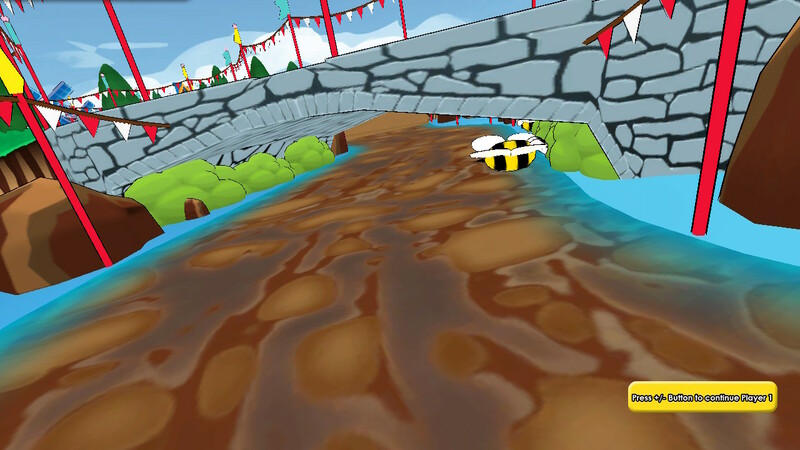 Hello Kitty Kruiser’s 16 tracks are split into six road races, five river races and five air races. Naturally, this means there are three types of vehicle: cars, boats and planes. There are ten in each category, meaning 30 vehicles in total. Only 12 of these are available when you begin the game: the rest unlock as you work your way through the 20 missions in the game’s Adventure mode. As with the characters, each vehicle has three different designs to choose from. These are just colour changes, though: they don’t affect the vehicles in any way. Here’s a look at the vehicles in each category. CARS – A relatively similar selection of jeeps, buggies and sports cars, including one with Hello Kitty’s face on it. Which must be pretty embarrassing when she’s driving it, and massively awkward if anyone else is. BOATS – These fall into either the speedboat, hovercraft or ‘small rubber ring type thing’ category. Which is probably a hovercraft too, now I think of it. I don’t know what to believe any more. PLANES – Single propeller? Twin propeller? Biplane? The possibilities are endless (as long as you stop counting at three). Points for letting you choose between different vehicles instead of just giving everyone a single generic one. However, it’s pretty much the bare minimum beyond that: the ‘ten’ vehicles in each category are really just three, none of them have any discernible difference in handling or feel compared to others, and they all just look and feel a bit bland. 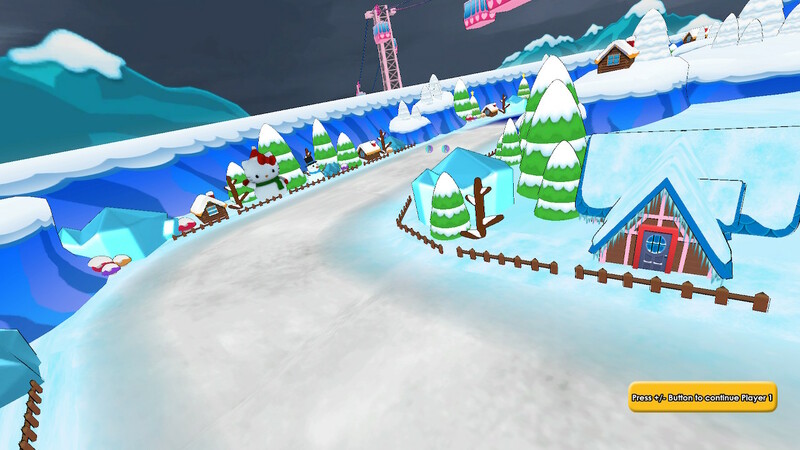 There are a total of 16 different tracks in Hello Kitty Kruisers, but in reality there are only five different environments ticking the standard karting game boxes: town circuit, beach, ice, forest and space (complete with rainbow roads, naturally). Here’s a look at all 16 tracks, along with their descriptions in the captions. TOWN CENTER RALLY – A humdrum jaunt through a quiet town complete with coloured houses and statues of Sanrio characters. 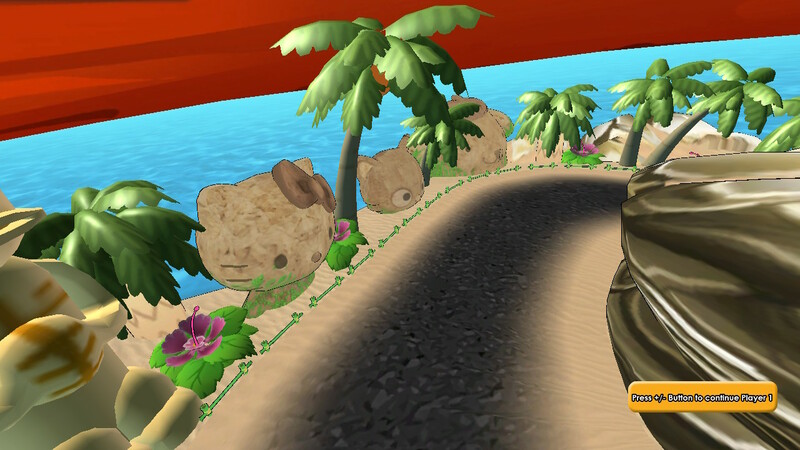 ISLAND PARADISE BOAT RACE A – Get in your floating device of choice and leg it down a river in this beach-themed stage. Sanrio statues feature again, obviously. 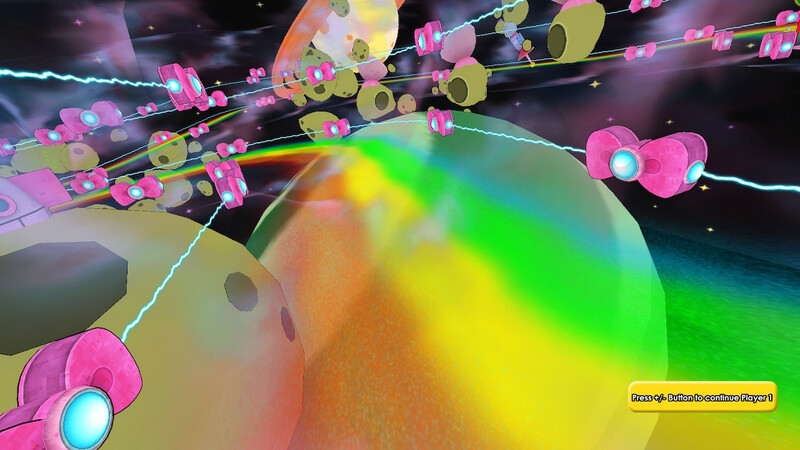 COSMIC WAY FLY-BY – Playing its Rainbow Road hand a bit too early here, this is a plane stage where you have to dodge floating asteroids which look more like potatoes. 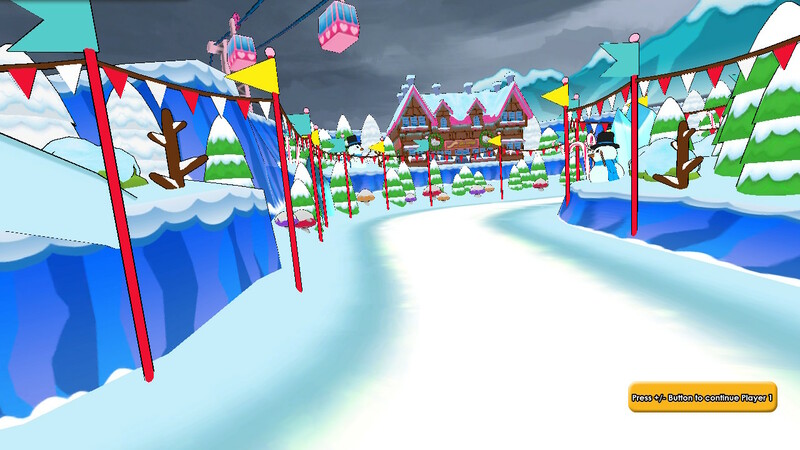 ICICLE ALLEY RALLY – The first cup ends with this snow stage, which more or less feels like the town one except there’s a bit with a big patch of ice. 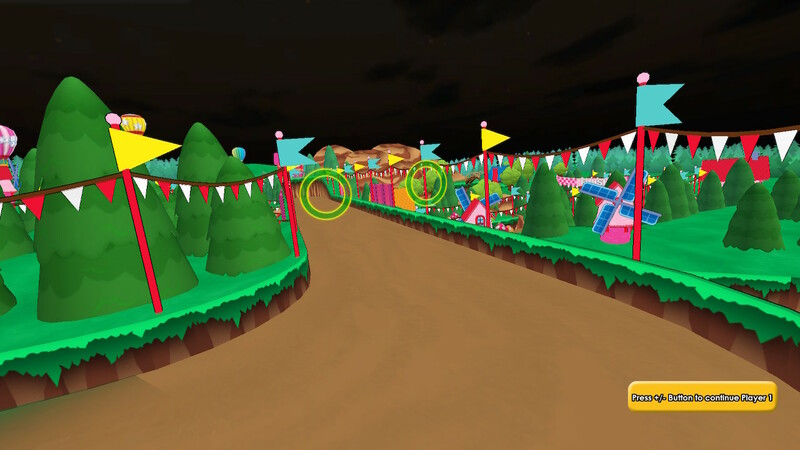 TROPICAL FOREST FLY-BY – The second cup opens with this flying stage set in an alleged ‘tropical’ forest, which naturally comes with two things you always get in those: windmills and depressingly dark skies. TOWN CENTER BOAT RACE – The town’s been flooded! Don’t worry about rescuing the presumably drowning Sanrio characters, just get in your boat and race through a similar track to the road one. COSMIC WAY RALLY A – You can maybe figure out how this is going to go now for the rest of the courses. Here’s the Rainbow Road style track from before, but this time it’s for cars instead of planes. ICICLE ALLEY FLY-BY – Sure enough, here’s the snow track from the first cup, but now you’re flying through it. COSMIC WAY RALLY B – Because you can’t really get a river race in space, you get to drive round it in a car again, this time with a slightly different track layout. TROPICAL FOREST BOAT RACE – That dark windmill-heavy forest still isn’t quite as tropical as you’d hope when you’re in a boat instead of a plane. Still, at least the sky’s no longer dark: it’s now an odd reddish-brown. My money’s on a forest fire. TOWN CENTER FLY-BY A – You’ve already been round the town in a car and a boat, so why not complete the set? Because they’re still trying to bury those who died in the flooding, that’s why (note: this theory isn’t canon). ISLAND PARADISE BOAT RACE B – If you hadn’t had your fill with island boat racing before, you get to do it again to finish off the third cup. TROPICAL FOREST RALLY – Hooray, the sky’s finally blue! Well, bluish-grey. It still isn’t quite cause to celebrate, though: the game’s idea of a ‘tropical’ rally involves driving through muddy rivers. 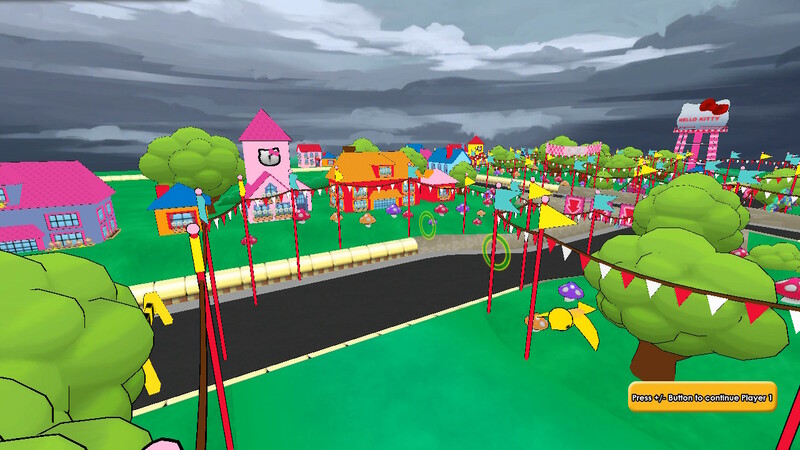 TOWN CENTER FLY-BY B – Pay your final respects to Sanrio Town’s fallen with another sombre flyby over its mourning community. ICICLE ALLEY BOAT RACE – I don’t really understand how there’s water in a location known primarily for being ice-themed, but there you go. 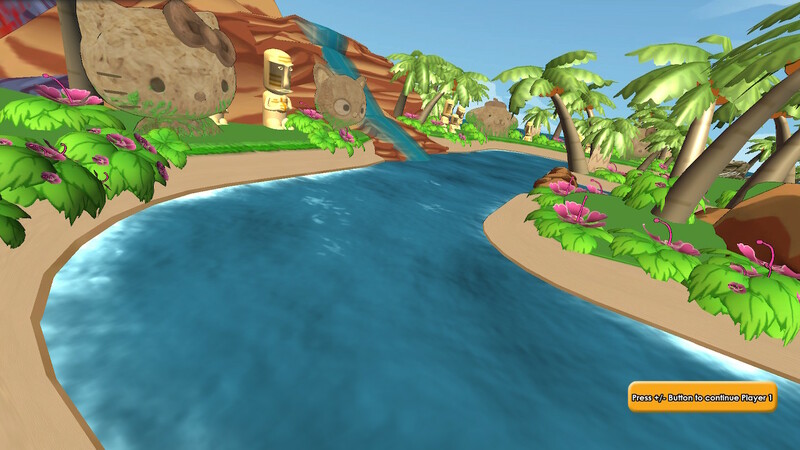 ISLAND PARADISE RALLY – Finally, the game ends with one more trip to the island paradise, its burnt umber sky a continual reminder that paradise is never what you seek. Or something. 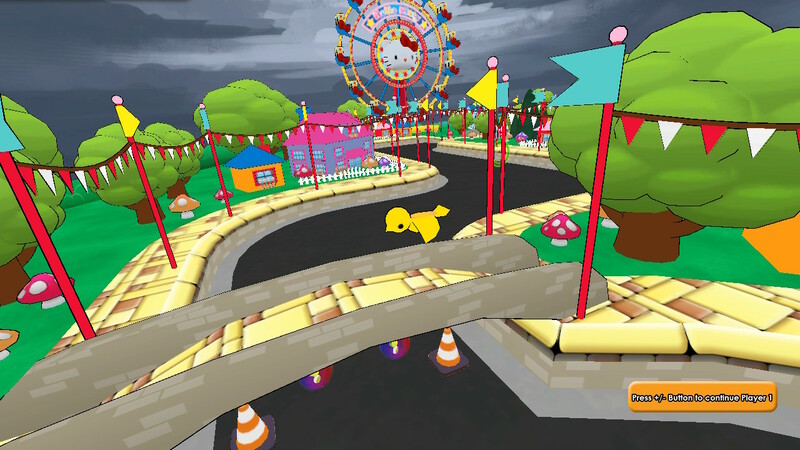 Racing the same five environments with different vehicles doesn’t really cut it, and the generic locations – the occasional trackside Sanrio statue aside – could be from anywhere. 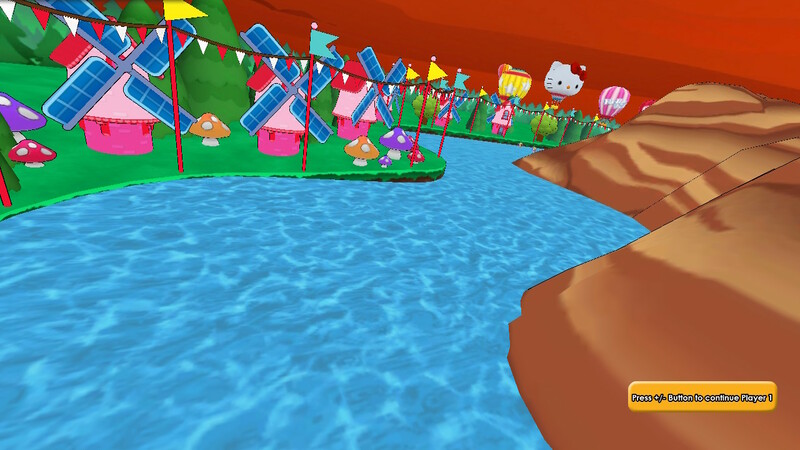 By now you may have come to the conclusion that Hello Kitty Kruisers is fairly bare-bones and isn’t really pushing the boat out (or the plane or car) when it comes to new ideas. The power-ups won’t change that opinion: there are six to find, and they’re all based on Mario Kart items. Here’s a run-down. 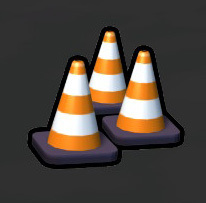 You get three cones when you pick this up. Dropping one behind you will cause an opponent to drive into it. 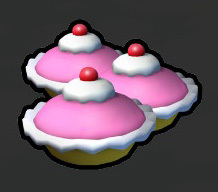 These pink cakes don’t really look like they’d do much damage, but they’ll spin an opponent out if you hit them with one. Sanrio characters must just be terrible bakers. 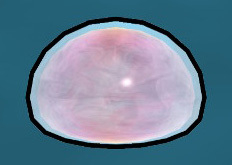 This useful pink shield protects you from enemy attacks. Since there are no homing weapons in the game though, it’s actually more useful as an offensive weapon, as driving into an opponent with your shield activated will spin them out. Pretty self-explanatory, these. 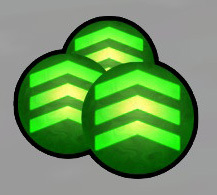 Three speed boosts to use as you see fit. Considering how slowly the karts usually go, these are massively overpowered. 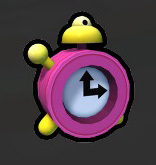 Trigger the Alarm Clock and every other racer on the track will slow down to a crawl for a short while. An even slower crawl than they’re already at, I mean. 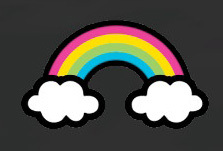 If you’re struggling near the back of the pack, the Rainbow will help you so you don’t have to confess to your mates that you can’t even beat a kids’ game. For a limited time it’ll boost you through the course at high speed, taking all the corners for you. Almost no thought has gone into these weapons, and they feel so light and flimsy that there’s no real satisfaction in hitting an opponent with them. Hello Kitty Kruisers is clearly aimed at the younger end of the gaming spectrum, but it fails to consider that any of the adults who grew up collecting Sanrio stuff may be keen to play it too. There are four cups here, each containing four races, but there are no difficulty levels to choose from. It’s an extremely easy game because of this, and once you’ve won each cup you’ve seen more or less everything the game has to offer. Well, almost everything. There’s also an Adventure mode, which basically consists of 20 different missions. These come in four different flavours: you’ll either be collecting cupcakes, collecting apples, going through gates or finishing a lap in a certain time. Unfortunately, these are also easier than fighting a sloth, and as a result they’ll only add about another 40 minutes or so to the game’s total length. The other main issue, as you can probably see, is that it’s painfully slow. This one’s just screaming out for different speed settings like Mario Kart’s 50, 100 and 150cc: instead you’re stuck with what feels like half a cc. Which I believe is just a ‘c’. I promise it isn’t usually this exciting. Depending on the track you’ll race in either a car, plane or boat. Each of them handles relatively well, though the boat is perhaps a little too loose for my liking. It’s understandable that it wouldn’t have the same grip going round corners, but younger players may get frustrated at just how far it can swing out. Powersliding is also an odd affair. You can hold a shoulder button to start sliding, and when you let go your vehicle will head straight in the direction you’re facing. This lets you pull off some sharp turns, but it’s really awkward because as you perform the slide the camera stays in the same position it was in, instead of turning with you. As a result you can’t see where you’re going when you come out of the slide. 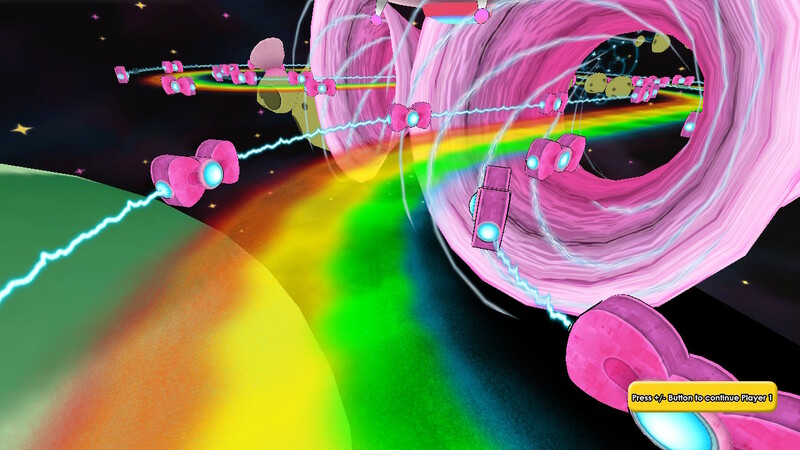 Deep in the foundations of Hello Kitty Kruisers there’s a good game somewhere. The problem is that pretty much every element of the finished product – the low difficulty, the lack of speed, the odd powerslides, the generic tracks and cars – holds that good game back, and the final result is something that anyone with a shred of gaming ability will have completely cleared in a couple of hours. 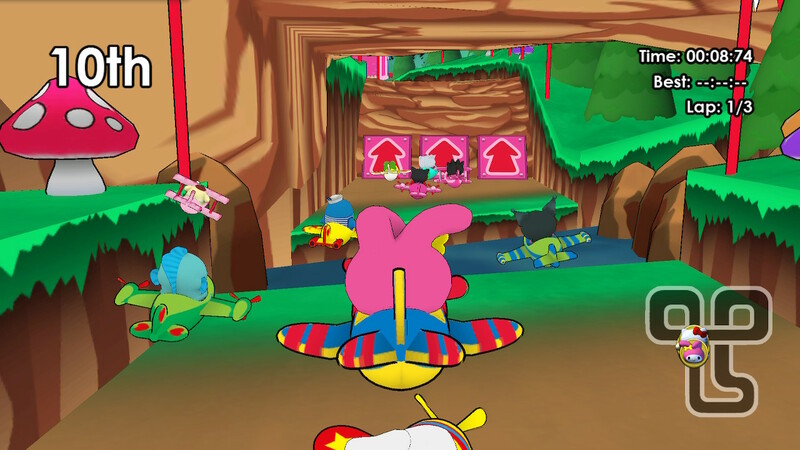 Hello Kitty Kruisers makes disappointing use of a well-loved licence by taking a bunch of Sanrio characters and dumping them in generic vehicles, putting them on generic tracks and giving them generic power-ups to use. 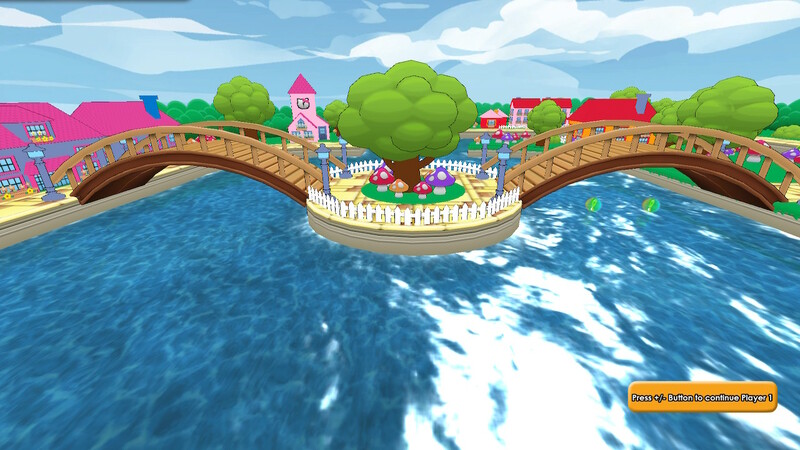 Its extremely low difficulty level means this is a game strictly aimed at young children. While they may get a kick out of it for a while, though, if they’ve ever had a sniff of Mario Kart in their brief lives to date then even they’ll be able to figure out that this one isn’t quite cutting it. Goodbye Kitty, more like. Do you get it? Hahaha, brilliant. Kartology will be back soon with its second instalment. Classic Scullion humour, I cared more about this than I should have done, considering its subject matter. It reminds me of an old magazine review of a 60% game – a good magazine, I mean, N64 or its family. Since it’s not a 60% game, perhaps it could have done with a bit more comedy vitriol? There’s nowt so funny as a reviewer really letting rip about a mind-breakingly dump game, and it doesn’t happen a lot these days. on the other hand, if you’re trying to keep Sanrio from ‘doing a Kuromi’ all over your house then fair enough. I loved this article – can’t wait for the next one! I don’t think anyone else has ever put this much effort into analysing this game as you have. For that, you have my respect. In all seriousness, I’m already loving this Kartography series though, while I know it’s meant to focus on more unknown titles, I’d love if you did some more popular and recognisable ones every once in a while (like Diddy Kong Racing or the Sega All-Stars Racing titles).